Brigadier-General Joseph Finegan, CS Army, c. 1861-1865, (Library of Congress, public domain). Reports of Brig. 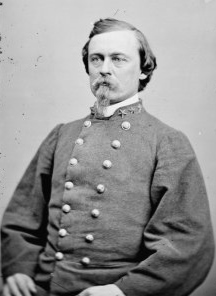 Gen. Joseph Finegan, C.S. Army, commanding Department of Middle and East Florida. LAKE CITY, FLA. October 2, 1862. I am hard pressed on the Saint John’ River; 3,000 men reported by the commanding officer at Saint John’s Bluff as having landed at Mauport Mills. The enemy enegaged our batteries again and were repulsed. Please send me one regiment of infantry as soon as possible. I asked for a regiment some ten days since, but have not heard from you on the subject. LAKE CITY, FLA., October 2, 1862. GENTLEMAN: I am hard pressed on the Saint John’s River. The commanding officer at Saint John’s Bluff reports 3,000 Federals are being landed at Mayport Mills. The enemy engaged our batteries again yesterday for the third time and were repulsed. I have not sufficient men to resist a land attack if made in force. Do go at once to the Secretary and get one or two regiments of infantry from the coast of Georgia. If I had them for a few days it might save the Saint John’s River and perhaps East Florida. Jacksonville, Fla., October 3, 1862. On my arrival on the river last night I found that the post at Saint John’s Bluff had been evacuated. The enemy made a landing some 5 miles in the rear of the battery, but in what force I am unable to say. As at present advised I think we had sufficient force to hold the place, and that its abandonment by Lieutenant-Colonel Hopkins, the commanding officer, was a gross military blunder, that may require investigation. Reports of Lieut. Col. C. F. Hopkins, C.S. Army, and resulting correspondence. CAMP DUNHAM, FLA., October 8, 1862. I deem it necessary that at least one regiment of infantry should be sent to this point without delay to protect our rear. * * * The force of infantry now here is not sufficient to repel an attack made in force, and in addition to the limited number for read defense we have not ammunition sufficient for small-arms for more than one hour’s fight closely contested. I am fully impressed with the belief that the enemy contemplate a land attack, as they will and have found it impracticable to succeed by water. I cannot urge upon you too strongly, general, the necessity for sending as soon as practicable re-enforcements of infantry. Sergeant Floyd, of Captain [J.] Westcott’s company, reported that from the old light-house he could distinctly see a very large number of men on both decks of a large transport steamer, which was anchored not more than half a mile from where he was. Three large transports have just come into the river, all crowded with troops. There are also seven gunboats, making in all ten vessels. The fact of their concentrating here so many vessels and troops is sufficient evidence of their intention to land a large force. You will therefore dismount the three cavalry companies under your command and send them over to-night by the steamer. The enemy landed this afternoon at Mayport Mills about 3,000 men; also artillery. You will repair without delay to these headquarters with your whole command. We need your artillery immediately. The cavalry companies dismounted, numbering about 110 men, were sent without delay; the artillery was not sent. It is proper, however, to add this his horses were at a distance and his caissons not with his pieces, and both time and means of transportation were very limited. Of these facts I was not aware when the order was sent. When I became aware – through a letter from Captain Dunham – that the artillery could not be obtained, I then wrote him a further order, which was sent him by the messenger bringing his letter, directing him to send over immediately all the men he could spare, and that would do my utmost to arm them, so that they might act as infantry. To this I received no reply. This was written at 3 a.m. on the 2d instant. At an early hour on the 2d instant intelligence was received from Captain [W. E.] Chambers, commanding a squadron of cavalry, that during the preceding night the enemy had landed in considerable force at Greenfield and were still rapidly landing. I immediately informed Major [T. W.] Brevard, commanding the infantry in the rear of the batteries, of the intelligence received, and directed him to place his forces in line of battle upon the position previously pointed out to him and so to remain until further orders. I could distinctly see from my position at the battery the landing of the enemy. The troops were transferred from Mayport Mills to Greenfield, as the transports were plying between the mill and the mouth of Pablo Creek and thence up the creek in launches. I immediately directed Captain Chambers to annoy them as much as possible when they commenced advancing, and, if possible, to hold them in check, it being impossible to prevent the landing without field artillery, as they were under cover of their guns. Captain Chambers proceeded to deploy his men as skirmishers as advantageously as the circumstances would permit. After some time he informed me that the enemy had commenced their advance in th following order, viz: Two hundred skirmishers in front, with a reserve; then their advance of three companies, and in rear their main column of 1,500 men; also artillery. Captain Chambers, after holding his position as long as he considered he could do so without being flanked, informed me that he had commenced falling back. This was about 1 p.m. From my position at the batteries I perceived that the landing still rapidly progressed after Captain Chambers fell back and continued for several hours, so that Captain Chambers could not have seen the full number, as men were landed in large numbers after he left the position from which his estimate was made. I communicated constantly with Captain Chambers and Major Brevard, receiving information from the former and conveying to the latter the result of my observations and sending such directions as were considered necessary from time to time. Captain Chambers was compelled to fall back steadily before the enemy, and finding that his camp would soon fall into their hands, burned his tents and other property. He still kept me informed of his position and that of the enemy, and his couriers informed me that the enemy were bringing field artillery with them. About this time a messenger came from Major Brevard, asking leave to proceed with his command in the direction of the enemy and contest his passage through the swamps, of which there were a few between them and the batteries. I perceived that this was our best chance to annoy the enemy with any effect and granted the leave asked. Before Major Brevard could move, however, intelligence was received from Captain Chambers that the enemy were now coming in two columns – one on the road as heretofore and the other much farther to the right. This second column had crossed Mount Pleasant Creek, and both columns moved apace with each other, guided by signal sounds. Major Brevard was not directed to remain in his present position. Shortly after tis further intelligence came from Captain Chambers that the enemy had passed through his camp and were within a few miles of the infantry, in rear of the batteries under Major Brevard. It was not growing late, and Captain Chambers was directed to fall back nearer to Major Brevard’s position, as there was very indication that the enemy would make no halt, and it was desired to have his men in sufficient proximity to place them as circumstances should require when the enemy came up. I also sent out from the batteries a detachment of 45 men, leaving only four gun detachments at the bluff. Deeming it necessary to strengthen the infantry, Captain [W.] Stephens, with his own company and this detachment, was directed to take position considerably to the left of Major Brevard’s line, as it was now tolerably certain that one of the columns of the enemy would follow the river as nearly as possible, in order that the advantage to them of their guns upon their shipping would be greater. The enemy now ceased their march. I now perceived that the greatly superior forces brought against us it would be impossible to successfully, or with any hope of success, make a stand against them. Our forces in rear did not number more than 500 men, including the detachment sent from the batteries. This detachment was partially armed with the almost useless arms turned over by Captain Dicksison. Captain [W. H.] Milton was, in effect, unprovided with ammunition, and Captain Chambers reported the ammunition of his squadron damaged by the rain, which fell constantly during the day. This was not, therefore, an efficient force. I had only four gun detachments at the batteries. The enemy had, by report of Mr. Haynes (in every respect a reliable man), 3,000 men; also artillery. By the estimate of Captain Chambers they had 2,500 men in their main column (also artillery) at the time he was forced to fall back from Greenfield, and for four hours after Captain Chambers had fallen back from my position at the batteries I could distinctly perceive that rapid landing was still in progress. From the number of boats used and the rapidity with which they plied between the vessels and the landing I estimated that they could not have landed less after Captain Chambers had fall back than 300 men per hour. Therefore, at the very smallest estimate, not less than 1,000 men were landed after Captain Chambers had left the ground. Against this force it was simply impossible to hold the batteries. I therefore called a conference of the officers at the batteries. Captain [John C.] Richard, Lieutenant Stuart, and myself were present, and the question of the practicability of holding the place was discussed. The opinion was unanimous that our forces were not sufficient to resist those against us in our rear. I then sent a courier to Major Brevard, informing him of our conference at the batteries, and requesting him to procure an expression of opinion from himself and the officers commanding companies outside the batteries. In the mean time [sic], however, I understood a conference had been held by the several captains under Major Brevard, sustaining unanimously the opinion that the forces there were insufficient to repel the enemy in front. At 9 p.m. the post was reluctantly abandoned. Comdg. Department of Middle and Eastern Florida. Respectfully referred for the information of the commanding general. While I impute no want of courage to the officer in command, I consider that he mistook his duty as an officer in not making a personal reconnaissance of the enemy, their strength, position, &c., and in not resisting with the whole force at his command their approach to his works. If overpowered by actual conflict with the enemy it was then the duty of Lieutenant-Colonel Hopkins to have spiked his guns and destroyed his ammunition and retire in the best order he could. Neither of these seems to have been done. The evacuation seems to have taken place some eighteen or twenty hours before the approach of the enemy, by land. The guns were not spiked, nor the ammunition, of which there was a large quantity, destroyed. Alum Bluff, Fla., December 24, 1862. GENERAL: I have the honor to state, for the information of the commanding general, that his communication of November 3, through General Finegan, has been received. In reply, I inclose my demand for a court of inquiry and the decision of the court. Brigadier-General Finegan says in his report to you that I mistook my “duty as an officer in not making a personal reconnaissance of the enemy, their strength, positon,” &c. In reply to this I assert that I did make a personal reconnaissance of the enemy with a glass from the batteries, and could plainly and distinctly see the men as they disembarked from the transports into smaller boats and were conveyed up to the landing in Pablo Creek; and from the number that I saw land I was convinced that unless I made a retreat my small command would be capture, as the guns from the batteries afforded no protection to the rear. In regard to not spiking the guns and destroying the ammunition I did save as much of the ammunition as I could get transportation for, which was only one wagon load. I did not break the trunnions of the guns because the noise made in so doing would have exposed our designs to the enemy. I did not spike them because I had nothing to do it with and did not consider it important, as they did not bear upon the rear or the direction which we retreated. Brig. Gen THOMAS, JORDAN, Chief of Staff, Dept. S.C., Ga., and Fla.
CAMP FINEGAN, October 8, 1862. GENERAL: As there have been expressions of opinion, and reports put in circulation based upon them prejudicial to myself and the volunteers under my command in the evacuation of Saint John’s Bluff on the night of October 2, I respectfully demand that a court of inquiry be called at the earliest day practicable to examine into the facts of the case and the policy of the course pursued by myself upon that occasion. NO. ___, DEPT. EAST AND MIDDLE FLORIDA, Camp Finegan, October 18, 1862. At the request of Lieut. Col. C. F. Hopkins, late commander at Saint John’s Bluff, a court of inquiry is hereby ordered, to convene at this post at 10 a.m. on to-morrow, to take evidence of the facts relating to the evacuation of post at Saint John’s Bluff, with its armament and stores. The court will be composed of the following officers: Lieutenant-Colonel Mitchell, Twenty-ninth Georgia Regiment; Lieutenant-Colonel [T. W.] Mangham, Thirtieth Georgia Regiment, and Lieutenant-Colonel [H. F.’ Abell, Milton Artillery, as judge-advocate. CAMP FINEGAN, October 11, 1862. The court, after patiently hearing the testimony adduced by the several witnesses, and after mature deliberation, give it as their opinion that Lieutenant-Colonel Hopkins, with the effective force at his command, could not, under the existing circumstances, have made a successful defense of the batteries; and, further, from the evidence the court is of the opinion that the evacuation of the batteries was positively necessary for the safety of the men under his command, as an attempt to have held it against the greatly [superior] land force of the enemy would have inevitably resulted in the complete reduction of the batteries and the capture of the command. We therefore consider Lieutenant-Colonel Hopkins wholly justifiable in the course he pursued in abandoning the batteries on the Saint John’s. Lieut. Col., Comdg., Twenty-ninth Georgia, President of the Court. Reports of Brig. Gen. Joseph Finegan, C.S. Army, commanding Department of Middle and East Florida; Reports of Lieut. Col. C. F. Hopkins, C.S. Army, and resulting correspondence; and report by William D. Mitchell of the decision by the CS Army’s Court of Inquiry into the abandonment of Saint John’s Bluff, in Official Records of the Union and Confederate Armies, 1861-1865 (National Archives Microfilm Publication M262, 128 rolls). Washington, D.C.: U.S. National Archives and Records Administration.